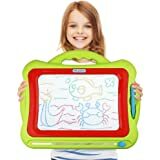 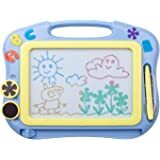 Magnetic drawing board provides a fun way for kids to learn drawing, writing, playing games using attached stylus，help your children develop creativity and practice coordination on this magic doodle board. 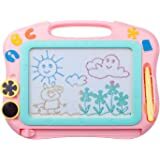 Erasable multi-coloured sketch writing board contains yellow, green, blue and red, colorful magnetic powder with 3 cute animal stampers makes the drawing much vivider, help kids to explore more of their little world. 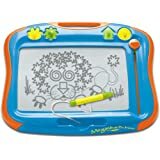 Simply slide eraser can wipe out all doodles and start your new creativity quickly, little artists explore creativity by drawing pictures. 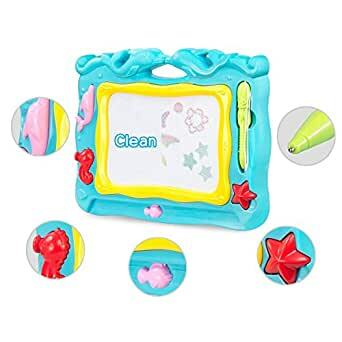 Newly-designed dolphin magna doodle made of non-toxic high quality ABS, safe and enviromental, drawing screen with 3 cute animal stampers and 1 magnet writing pen that kids will love it. 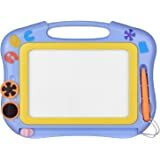 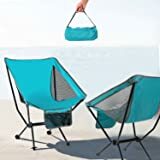 We suggest for kids 36+ months, small size, lightwieght travel toy is a good choice for kids gift.